The Trafalgar, 23 High Path Merton is the CAMRA SW London Pub of the Year 2017. The CAMRA South West London Pub of the Year for 2017 is the Trafalgar, 23 High Path, Merton, SW19 2JY. Many congratulations to Rodger Molyneux and the rest of the team. Trafalgar, 23 High Path, Merton SW19 2JY. Eagle Ale House, 104 Chatham Road, Battersea SW11 6HG. Railway, 2 Greyhound Lane, Streatham, SW16 5SD. There were eight pubs in contention for the CAMRA South West London Pub of the Year for 2017. Crown & Sceptre, 2A Streatham Hill, SW2 4AH. King & Co, 100 Clapham Park Road, Clapham SW4 7BZ. Trinity Arms, 45 Trinity Gardens, Brixton SW9 8DR. Four Thieves, 51 Lavender Gardens, Clapham Junction, Battersea SW11 1DJ. Old Sergeant, 104 Garratt Lane, Wandsworth, SW18 4DJ. All current CAMRA South West London branch members were eligible to vote. The branch Pub of the Year is awarded a certificate and automatically goes forward to CAMRA's shortlist for Greater London Pub of the Year. The winner of that award goes on to a 'super-regional' competition and, if successful again, would be on the shortlist for CAMRA national Pub of the Year. The result will be anounced at the start of our branch meeting on Thursday 15 Feb 2018 at the Trafalgar Arms, Tooting and will be published at 19.45 on Facebook and Twitter and via an email to our branch members who have an email address registered with CAMRA. This website will be updated on the following day, Friday 16 February. If you have never registered your email address with CAMRA - or if you have a new or changed email address - then please update your membership details on the main CAMRA members' website. Sign in at members.camra.org.uk, then click on the My Membership button followed by the Edit Your Membership Information button. Your membership details open in a new secure window and you can amend them as necessary. If you have forgotten your CAMRA password or need to set up a new password then go to password.camra.org.uk/. South West London branch members who do not have an email address registered with CAMRA should have received a printed Pub of the Year 2017 ballot form with the annual branch mailout at Christmas. The deadline for these to be completed and returned was Sunday 11 February 2018. Ballot forms received after this date were not counted. 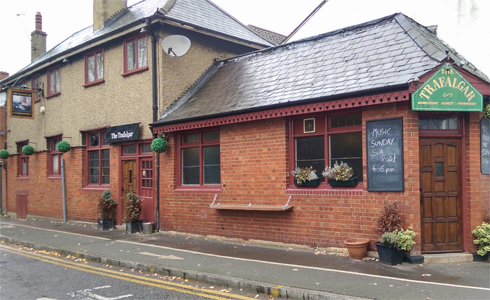 The 2016 South West London CAMRA Pub of the Year was the Sultan, 78 Norman Road, South Wimbledon SW19 1BT. NOTE: The previous year's winner is excluded from this year's ballot as per CAMRAswl branch rules so the Sultan is ineligible for the 2017 vote.